Looking to switch up your dinner routine? 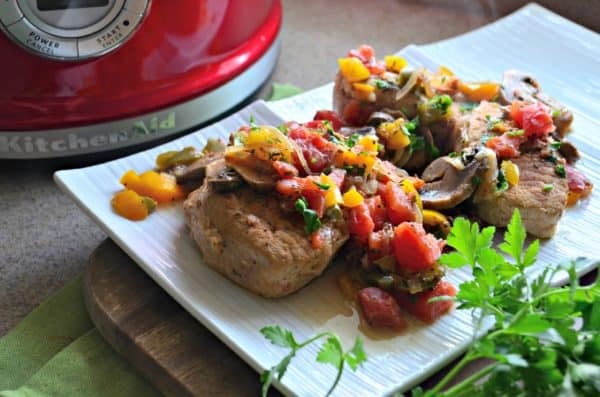 Try my recipe for Skillet Italian Pork Chops loaded with fresh vegetables that gives the pork chops a flavorful boost! I try to make a wide variety of entrees for dinner each week. I alternate between chicken, beef, pork, fish, and vegetarian meals. I do this to ensure that we don’t get tired of the same old meals. I’ve found that I always struggle with how to prepare pork chops. I almost always bake them with breadcrumbs in the oven. 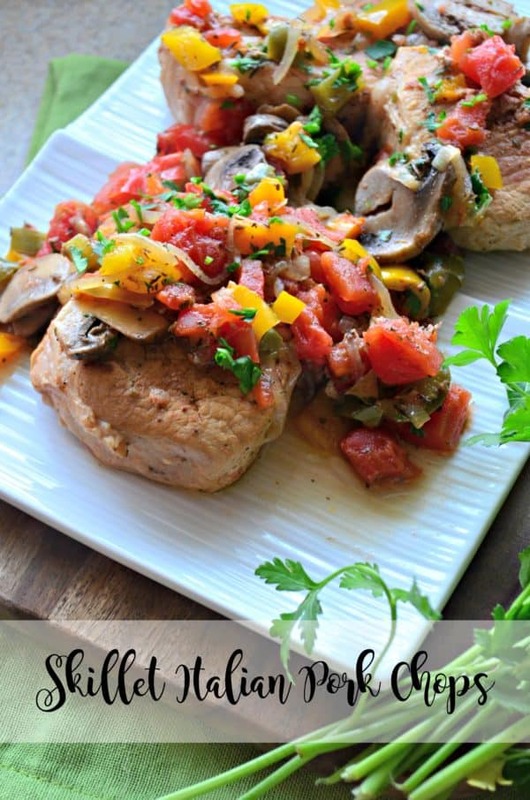 My mother in-law has been making this recipe for years and it’s a great alternative to the traditional baked pork chops. I recently found myself buying up a huge package of pork chops at Costco. They were $3 off and I couldn’t resist. It was spectacular deal. When I started menu planning, I knew I didn’t want to bake all these pork chops I just bought. That’s when I remembered this recipe for Skillet Italian Pork Chops. I immediately sent a text to my mother in-law about the ingredient list. I had a rough idea but wanted to know the exact details. She gave me just that… a rough idea on the ingredients. So I got to work in the kitchen and made the recipe a little bit of my own! I love that you essentially make a sauce using canned tomatoes, fresh bell pepper and mushrooms. The secret ingredient is the herbes de Provence seasoning that is added to the sauce. Without this seasoning the pork chops are not complete. So if you don’t have this seasoning in your pantry, go buy it now for this recipe! If you like a little kick to your food we like to add in red pepper flakes. That’s optional but we love it that way and so does my feisty two year old! 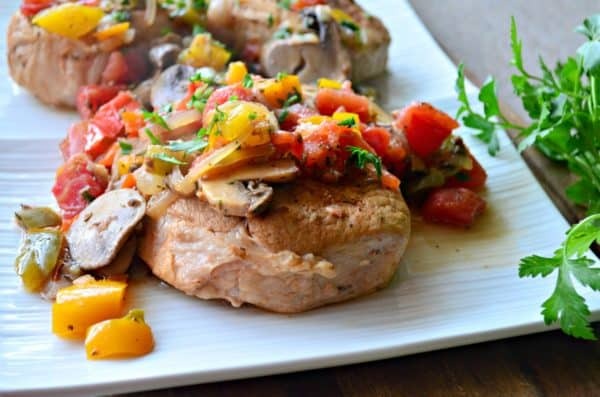 If your looking to change up your dinner time routine I highly suggest you try my recipe for Skillet Italian Pork Chops. They are sure to be a new family favorite! 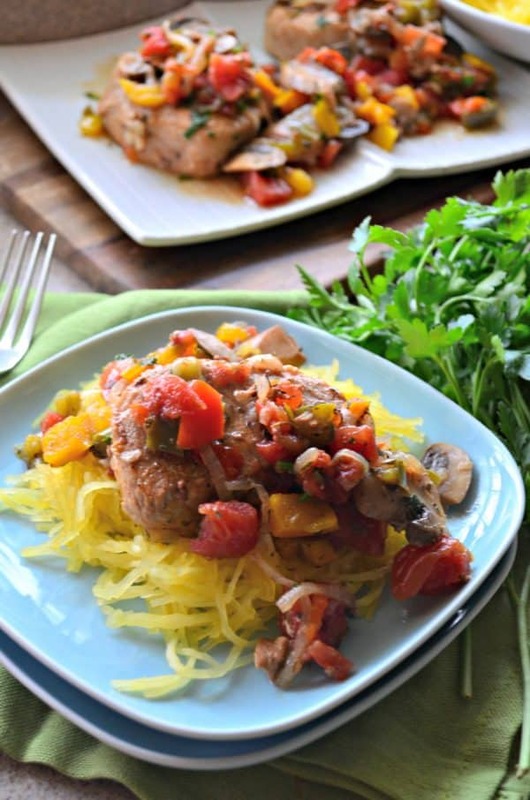 You can serve the pork chops on a bed of pasta or if your trying to be healthy on a bed of spaghetti squash. Either way–it’s delicious!